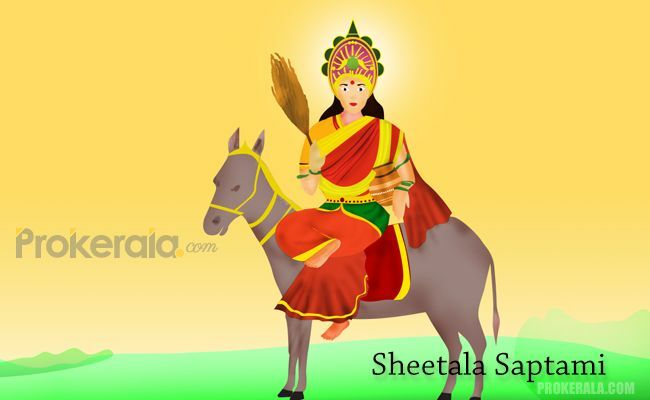 Sheetala Saptami is an important Hindu festival dedicated to Goddess Sheetala or Sheetala Mata. It is observed twice in a year, once during the ‘Krishna Paksha Saptami’ (7th day during the waning phase of moon) in the Hindu month of ‘Chaitra’ and the second occurrence is during the ‘Shukla Paksha Saptami’ (7th day during the waxing phase of moon) in ‘Shravana’ month of the traditional Hindu calendar. As per the Gregorian calendar, these dates correspond to the months of March-April and July-August respectively. Of these two observances, the one in the Chaitra month is very important. On the day of Sheetala Saptami, Hindu devotees worship Goddess Sheetala to protect their family members, especially children from contagious diseases such as Chicken Pox and Small Pox. This festival is celebrated with great fervour all over India, specially the rural regions. In the southern states of India, Goddess Sheetala is worshipped as ‘Goddess Poleramma’ or ‘Goddess Mariamman’. In Karnataka and Andhra Pradesh, a similar festival as Sheetala Saptami is observed, which is known as ‘Polala Amavasya’. On the day of Sheetala Saptami, Goddess Sheetala Devi is worshipped. People get up early in the morning and bath in cold water. Later they visit the temples dedicated to Sheetala Mata to offer their prayers. Various rituals are performed on this day for a peaceful and happy life. On Sheetala Saptami some of the devotees also get a ‘mundan’ (shaving of the head) in the honour of Goddess Sheetala. In some places, people do not prepare food on this day and consume food, which is prepared on the previous day. Eating hot food is strictly prohibited on this day. Some devotees even keep a vrat on this day to please Goddess Sheetala. Women mostly keep this fast for the well-being of her children. The significance of Sheetala Saptami is mention in the ‘Skanda Purana’. Sheetala Saptami is dedicated to Goddess Sheetala. In Hindu mythology, Sheetala Mata is the Goddess of Small Pox. She is considered to be an incarnation of Goddess Parvati and Goddess Durga, the two forms of Shakti worshipped in Hinduism. Goddess Sheetala is known for inflicting people with chicken pox or small pox and also represents Nature’s healing power. Hindu devotees worship Sheetala Mata on this day, along with their children to seek protection from such diseases. The word ‘Sheetala’ means ‘cool’ and it is believed that Goddess Sheetala offers coolness to devotees suffering from contagious diseases. In some rural regions of India, there is still a practice of offering ‘Janthu Bali’ (Animal sacrifice) to please the Goddess.